High Performance Simulation is both an essential factor in corporate competitiveness and an absolutely vital tool for major scientific challenges. Thus it enables experts to design products more rapidly which are better suited to customers’ requirements and furthermore to analyse and understand complex phenomena.. Promoting High Performance Simulation is, therefore, a priority both for the industrial world as well as for the academic community and provides also an opportunity for IT specialized companies. 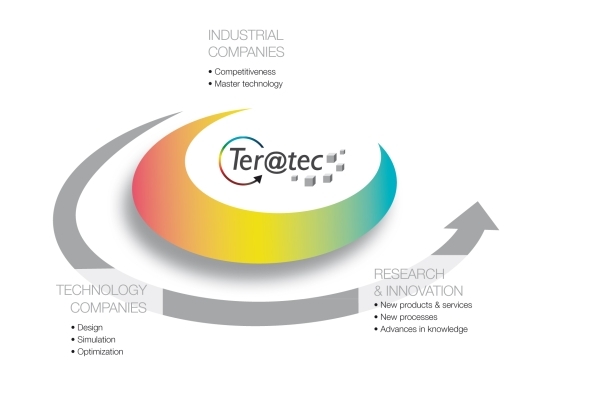 With this objective in mind major players in these different fields have created the TERATEC association together with local authorities keen to develop technological activities in their territory. To participate in the emergence and setting up of joint collaborative R&D projects. To enable access to state-of-the-art processing facilities among the most powerful in the world. The establishment of joint laboratories industry-research able to carry out cutting-edge research at the highest level in the field of high performance digital simulation. The presence of major players on a campus which will create a significant number of employment opportunities and generate new skills and competence related to numerical simulation. Effective assistance in nurturing and incubating start-ups and new companies. As a major player in Europe in intensive high-level simulation and computing, TERATEC is located in Essonne at Bruyères le Châtel. TERATEC forms the core of a technopole bearing the official R&D area and is a member the "SYSTEMATIC Paris-Region" competitiveness cluster.